(SA) Indian Economy 2009-10 Overview. Development in Economy Subsequent To The Recent Crisis. High interest rates, inflation rate, trade deficit, fiscal deficit and depreciation of Rupee is expected in the next few months. VMW have researched on the global economy with the projection of contraction in the economy is expected in the first half of the year and will likely to see expansion in some of the economies. Germany and France, the largest and second largest economies of the European Union respectively and Japan, the largest economy of Asia has emerged from the recession after 5 quarters, and the United States is somewhat shy to come out of the recession and is expected to expand by the end of this year. The main drivers which might helped the economy, is the active response by the Government Authorities, in a way of announcing trillions of dollars in stimulus packages. Central banks around the world have poured in billions of dollars into the system to make credit market works and slashed interest rates to almost nil to impede the economy to go into deeper recession. With most of the indicators are now offering the sign of strength, however the wobbling unemployment and unsustainable government support to the economy would hamper the growth process. Amid the bleak environment in the global economy, GDP growth in developing economies are shrugging the outlook of their economic growth. With most of the economies were in melancholy, economies like India and China registered a growth rate of 6.7% and 9% respectively. The immediate effect of the rebound in the global economy could be seen in the financial markets which have posted the spectacular gains in a short time. Since 2008 fallout, markets in India have been stabilized followed by the unprecedented victory in the recent elections, announcement of stimulus packages, and active response to the crisis by the central bank (RBI) which boosted market sentiment and anticipating greater reforms in the economy. In fact situation at the world level are also improving significantly. US economy in particular has offered strong signs of improvement in its economy and expunging the recession which begun in the last quarter of the year 2007. 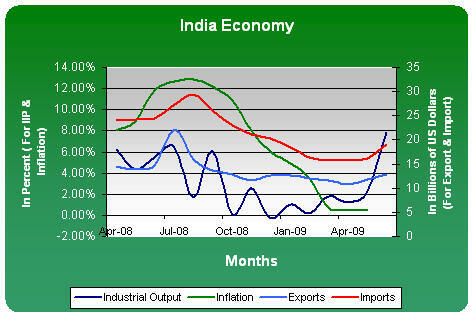 In the above Chart, which is showing the India’s IIP, Inflation, Exports and Imports from Apr 2008 to Jun 2009. All trend lines are showing the sign of stability from falling which was started in 2008. Over the last six years, Indian Economy grew at an average rate of 8%, becomes one of the world’s largest economy. In 2007-08, Indian Economy posted a growth rate of 9%, though the economic growth has slumped due to recession in the west for the year 2008-09. Service sector will continue to outnumber the manufacturing sector and account for more than 53% of the total GDP, but still less than the advanced economies. According to the GDP data, IT export is on the rise and outpacing the overall growth of the sector. Nasty Monsoon: This year’s deficient monsoon probably downgrade the overall economic growth as the Agriculture sector accounts for more than 18% of the total GDP. Uttar Pradesh, Andhra Pradesh, West Bengal, Punjab, and Haryana are the key farming locations of India. Almost scanty monsoon in Uttar Pradesh in particular will make a larger impact on India’s farm sector as the poor harvesting of Rice and Cane hit hard due to poor monsoon. Monsoon below average will make several kind of impact on India and other parts of the world. As India is the second largest producer of Rice and Sugarcane followed by the US and Brazil respectively, the commodity prices will go up, and according to the NYMEX data, the sugar prices soared by 62% since last year due to bad weather in India and the world had been affected by the food price crisis last year due to several reasons including poor harvesting due to drought situation and various other non-farm reasons. Primarily, capital inflows into India has supported the sharp “V” shape recovery in the BSE’s benchmark index, Sensex. Indian equity markets perked up by more than 90% from its March 2009 lows (See given below figure). Foreign investments, positive growth outlook, consumer confidence, good corporate earnings, better reforms prospect might be a specific reason of overall growth in the financial markets. But, will the rally be sustainable over the next few months as the economy would not be grown as fast as we had expected earlier? The global financial markets are trading at a reasonable value after sharp fall from the 2007 highs. From the beginning of this year, lot of money has poured into the markets around the world as the investors are optimistic about the economy. Developed economies would take more than two years to recover however the Asian economies will lead the overall economic recovery. Companies around the world has posted better than expected earnings in the last couple of quarters and showing the signs of recovery in their operations, nevertheless the growth in their earnings was ushered by cost cutting measures such as layoff and restructuring of their businesses. In general, their growth would be sustainable once the consumer confidence revives in the developed economies. Unruly Supply-Side: Over the next few months, we will see the higher inflation due to supply side exertion. Supply side concern may include shortage of food grains, higher stock of money in the system due to spiralling government borrowings will doubtlessly push inflation on the higher side. We will expect the monetary action from Reserve Bank of India (RBI) in response to the microeconomic developments. Over the next few months, perhaps the Interest rates would go up in response to inoculate the economy from the risk of higher inflation and currency depreciation. Economy in 2009-10: It would be bewilder that when we should expect the veritable recovery in the Indian Economy? Of course the Indian economy is not an exception and will go inline with the global economies. It will take a lot of time to recover however the situation has improved significantly and so far we have seen an extremely rapid movement in the economy. Moreover, the G-20 Summit, Pittsburgh in Sep 2009 will play a crucial role in the overall economic recovery as the global leaders were committed to monitor the situation and decision which were taken in G-20 Summit, London. However, we cannot expect the fresh stimulus packages from the Government Authorities to revive the economy.